1 bedroom, 1 bath, sleeps two adults, 1 child. Note: Charming two-story cottage. Top floor bedroom with queen-sized and single bed. Main floor living room with sleeper sofa, full kitchen, bathroom with shower, dining area. Satellite TV, DVD. Deck off living room. Walk-in basement. Private yet only .7 of a mile from town and beaches. Outdoor gas grill and shower. Clean. Ample parking. Washing machine. Located at end of dead-end road. Rentals through October available. Less than one-week rentals available beginning in October and before June. Car ferry reservations available for open August week. The property is close to town yet is private, bordering on acres of conservation land -- a very pretty view. The property also borders boy scout camp property. 15 minute walk to town. Also picnic table on deck seats four. Private deck overlooking conservation property. 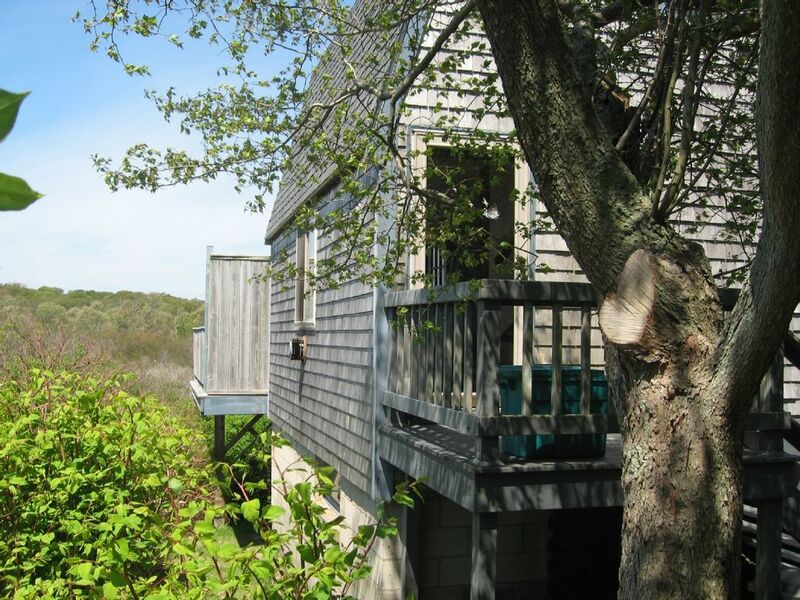 This cottage is a perfect escape for a couple looking to spend some time on Block Island. My wife and I spent a week here, and it worked out great. The cottage is nestled enough off the beaten path of Main Street to provide some peace and quiet, but close enough that it's easy to get to and from everything you want to do on the Island. There's a full kitchen as well as a great deck with a picnic table out back. We stayed there during a really hot and humid week, and even with that the breeze at night made it plenty comfortable for sleeping. The hosts were also very accommodating and helpful. They made sure we had everything we needed for our stay, and communicated clearly well in advance of our arrival with everything we needed to know. I'd definitely recommend a stay in this cottage next time you want to make the trip to Block Island! Thanks for taking the time to give us such positive feedback. We love it when our guests have a great stay! This was a wonderful place to stay for the week. It's quiet and comfortable and so charming. It's a comfortable bed, a small but sufficient kitchen, and a lovely back porch for drinking your coffee and enjoying island life. The back porch is so private, with views on all sides of endless vegetation and trees. If you have concerns that the cottage is too close to the main house, don't be. We felt like we were alone in our little world. The hosts were friendly and helpful. The island itself is wonderful, with a great grocery store*, plenty of restaurants and cafes, and lovely walks and beaches. We hiked the nature preserve with our dogs and ran on Mansion Beach almost every day, plus caught a beautiful sunset at Doris Point. * We were warned that the grocery store prices were very high, but I live in Brooklyn and it was about the equivalent for us. I suppose that says something about our neighborhood cost of living that we pay the same prices for groceries as an island where everything has to be ferried in and out. A note for those taking a "working vacation": the wireless internet signal was pretty weak but the cell phone signal was strong. If you need to get online for more than just a quick check of e-mail while you are there I'd be prepared to tether to your phone. That's not a complaint, though! I'll be staying here again next time I have a week where I can get out of the city. Thank you for a lovely review. We’re always happy when our guests enjoy the cottage. cottage. A friend and I prepared all our meals here, while my husky snoozed on the deck, after hours of hiking, and running on local beaches. Can't say enough nice things about this place. The hosts, Karla & John, were extremely pleasant upon our arrival. Through our stay they were non-intrusive.. The cottage is wonderful!!! Airy and bright. A surprisingly large bedroom with plenty of drawers and closet space. The living area is studio-like but roomy. The only drawback would be the size of the shower, but how many showers are big?? Close enough to walk to either New or Old Harbor, but bring a car as it is off the beaten path. Pretty darn close to perfect.. This cottage was everything the owners advertised. In a lovely setting overlooking a nature preserve, the cottage is on the same property and right next to the owners' main house (where they also have a B&B), but feels very private. The house is small, just enough space for two (and possibly a very small child). Downstairs is a small living room/dining area, and a kitchen and a bathroom. Lots of stuff cleverly arranged for the small space; there's also a deck right outside the living room. The upstairs bedroom is very comfortable and private. The house is extremely clean and well cared for. The owners are available but not intrusive. Since I'm an avid cook, if we were to rent this place again, I would bring more kitchen equipment (knives, cutting board, etc.). There's just enough stuff, but it's pretty basic. We had a lovely time. Block Island is beautiful, and off-season is so quiet and relaxing (we rented in October). I would recommend a car. Charming, secluded cottage. Short walk to town/beaches. Indoor and outdoor shower. Deck off living room. Pretty and clean. Located at end of country lane, bordering conservation property. Guests are to leave the cottage in the condition they found it in. Need to bring own linen and paper goods.